Actinidia chinensis or Golden Kiwi is a climbing shrub from China. The edible fruit is less hairy with shorter and softer hair that easily rubs off. The pulp is bright green, lemon green or bright yellow. It is oval and about the same size as that of Actinidia deliciosa but ends in a point. Taste is sweeter and more aromatic. The name kiwi is given by New-Zealanders. 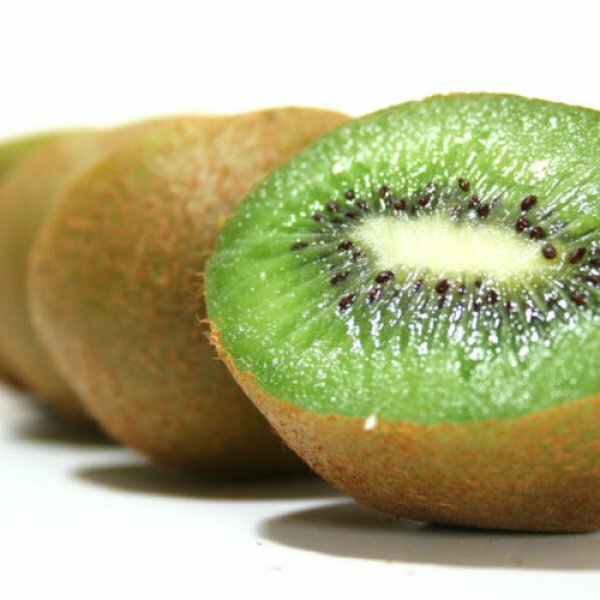 They were the first to grow kiwi commercially. 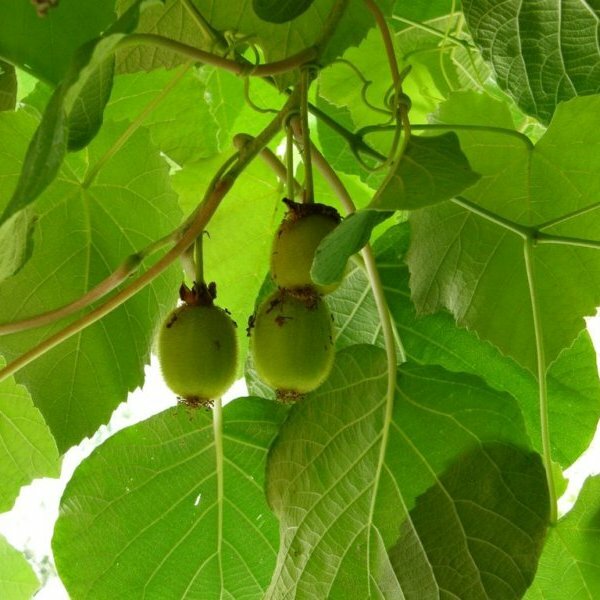 Actinidia chinensis is a dioecious vine that grows up to 5 m high. 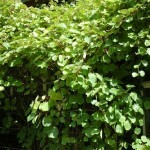 Leaves are large, leathery, heart-shaped, to 25 cm across, green that turns to a reddish color in autumn. Flowers are creamy white to yellow, slightly perfumed and to about 5 cm in diameter. They are produced in the leaf axils in may-june and pollinated door Bees. Female plants bear fruit if pollinated. In culture there are self-fertile cultivars. 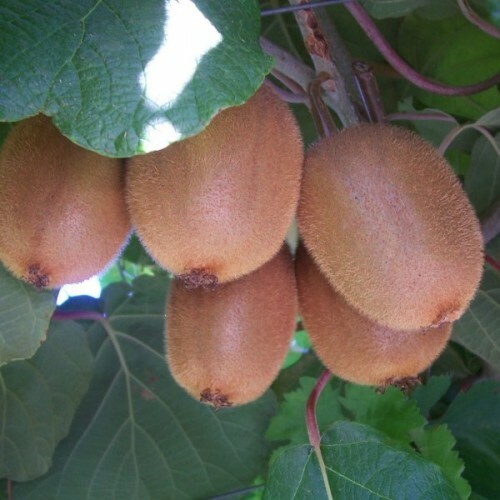 The fruit is an oval berry, up to 8 cm long, brown skin covered with fine hairs. The edible flesh is green, lime green or bright yellow with numerous small black seeds. Prefers warmer, preferably Mediterranean climates. There is a risk that young buds and flowering sustains frost damage from USDA zone 8 and colder zones. The plant is a climber but cannot attach itself to its support, it needs leading and you will have to fasten new branches to the climbing support. Harvesting will be easier if you provide horizontal support. Can also be grown over a pergola but harvesting may be a bit complicated. Germination It takes from 3 to 8 years for the plant to start flowering and producing fruit. Actinidia chinensis seeds need a cold period to germinate in the spring. This can be done artificially by putting the seeds for a couple of weeks in the fridge. But fruit bought in the store has undergone cooling during transport, so it’s not essential to stratify the seeds before sowing. After the stratification, sow in a light mix, moisten it. Keep at +20-+25C. Germination time: 3 weeks to 2 months.